This beautiful Christmas card was made with the Beautiful Baubles Bundle (the stamp set and matching Detailed Baubles Thinlits dies) I love how quickly you can put together a lovely image. The die cut in glimmer paper looks amazing against the Night of Navy cardstock. And the Night of Navy colour paired with white is a gorgeous Christmas colour combination. See the full list of supplies at the end of this post. 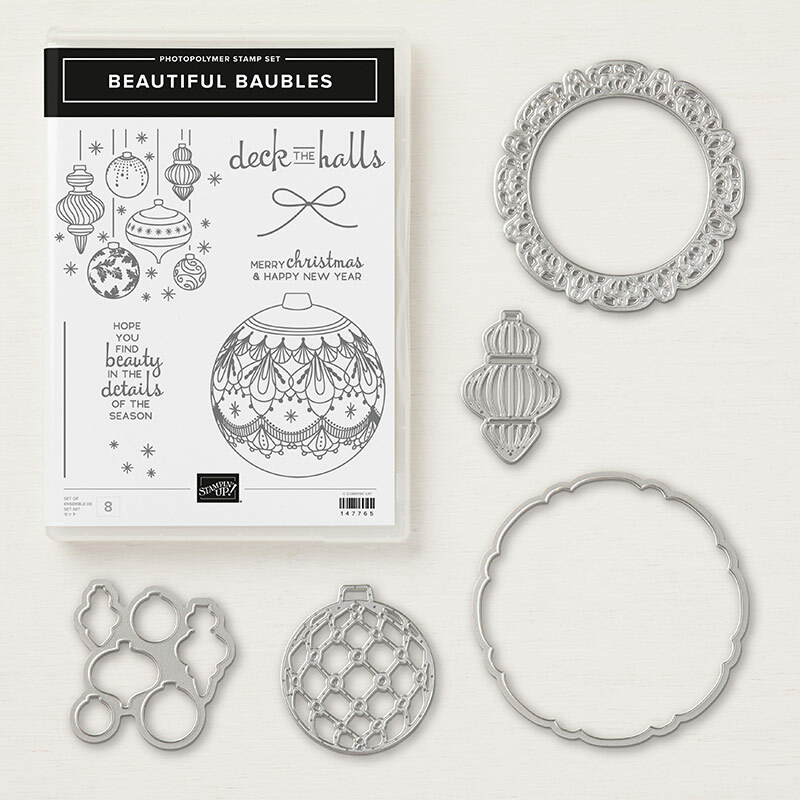 The good news is that the Baubles stamp set and dies are still available to buy, but the bad news is that they are both on the retiring list (as part of the Stampin’ Up! Year end Closeout Sales) and will no longer be available from any future Stampin’ Up! catalogues. So even if you are done your Christmas cards this year, you might want to take a look at this combination. The dies are are even on sale right now, so it is cheaper to buy the dies separately from the stamp set than to buy the bundle. Have a look at all that is on the Stampin’ Up! Year End Closeout Sales here. Also, on this card is the Tufted Embossing folder. It hard to see in the picture (better in the picture below), but it is so pretty behind the ornament. I just love the look of Night of Navy, Whisper White, and Glimmer together for an elegant Christmas card. To see any of these items in my online store, just click on any of the images.